Great service, quick delivery and good prices. Excellent customer service and speedy delivery. Up to now it does what a good battery should do. Another great battery purchase from Tanya! Good information beforehand from knowledgeable staff on required size/spec and the battery itself arrived v. quick via super friendly courier and really well packaged. V.G. price and solved my problem. Top Marks! Pleasure to make business with you. Competitive prices, excellent service. Securely packaged. I would highly recommend. One hint when sending to Sweden: the cheapest service is just enough. Every additional service like home delivery makes problems for Postnord. Delays delivery by 2-3 days. I got SMS that they "have no slot to deliver parcel the next days". In Sweden, everybody is used to go to collection points. A good battery and will last. The right size for the car. Brought this make before. Delivery was quick, will shop again. Great product, super service, exactly what I wanted. After shopping around for a car battery when the one in my Smart ForTwo gave up the ghost, I found Tayna and I'm so glad I did. Excellent choice of batteries, great prices and top class customer service. From order to delivery took lees than 24hrs and now my Smart Car is up and running again. Exactly as ordered and delivered very quickly. Excellent service. Good quality packaging. Easy to fit. In all, less hassle than driving & collecting from Spares supplier. Second time I have used Tayna and not disappointed. 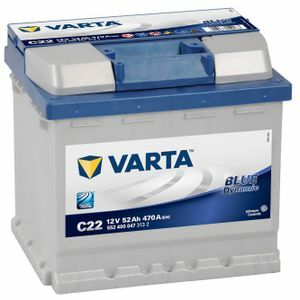 This Varta car battery was perfect replacement for genuine Solite CML45L. No problem with fitment into original battery fixing brackets.